The Empower Network is such a powerful affiliate network that it even has it’s own millionaires club which was launched in 2013. To date there are 15 members in the club with 6 just being recently inducted in October 2014. If you’re lucky enough to ever get inducted into the millionaires club then you’ll be presented with a custom made ring to honor your achievement. The ring is 14 karat gold and made up of over a whopping 80 diamonds. 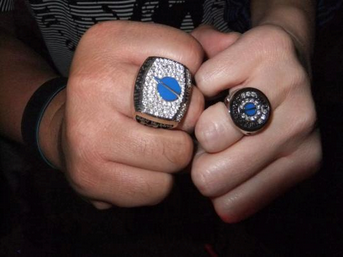 On the face of the ring is the Empower Network logo with the words “Millionaires Club” underneath it. It also contains the date that you passed the million dollar threshold. Whilst the million dollar threshold may seem unachievable to many, with a proper system in place it’s not actually as difficult as you might think due to the way the network works with it’s revolutionary 100% commission “pass up” system. Whilst I haven’t yet quite made the million dollar threshold, I have managed to make a 6 figure achievement with the Empower Network & I’ve published my guide completely free on this website. Basically if you follow the guide that I’ve published from start to finish it will allow you to replicate the exact method that I used to generate 6 figures in 6 months. If you’re already using the Empower Network I wish you the best of success & hopefully you’ll remember me if you manage to get yourself into the million dollar earners club!